The contest will run simultaneously on Facebook, Twitter and Instagram. The participant can play the contest on ANY ONE or ALL of the platforms. Follow Alive n Kicking and Mama Earth on Facebook. Name one of the Mama Earth products that you would love to gift to your little one in the comment section of this post. Share the giveaway post (public) on your timeline with with #WinWithMamaEarth and tag at least 5 friends (the more, the merrier). Follow artisanme79 and Mama Earth India on twitter. Name one of the Mama Earth products that you would love to gift to your little one in reply to this thread. Retweet the giveaway post (public) with #WinWithMamaEarth on your timeline and tag at least 5 friends (the more, the merrier). Name one of the Mama Earth products that you would love to gift to your little one in comment section of this post. Giveaway Duration: 17 Jan to 31 Jan.
3 lucky winners will be selected on basis of maximum engagement (one on each platform). Winners will get a baby essential kit for their kids. P.S. 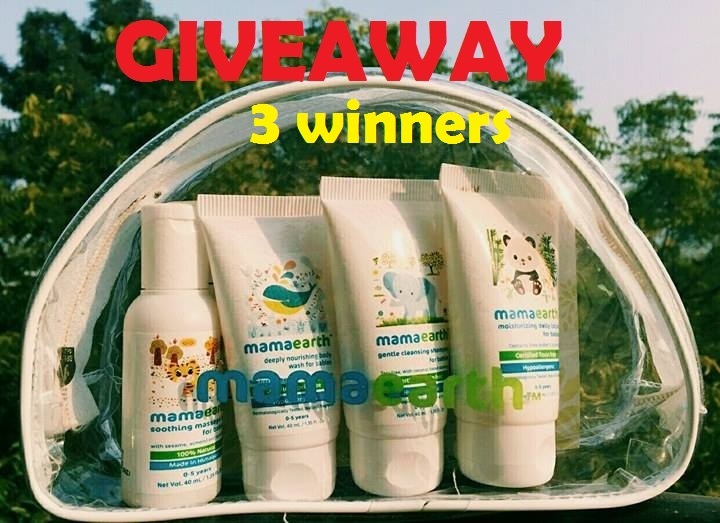 Its a sponsored giveaway by Mama Earth & the brand will be sending prizes. We won't take any responsibility of delay or damage in transit. Congratulations to Jagjeet Kaur, Preeti Tiwai and Shweta Ahuja for winning the Mama Earth gift packs for their babies. Kindly look for our message to claim your prizes. Thanks for the Loving Giveaway :) would wanna try these fab Products for my baby. baby produces is very nice. that I am like a all produces. One of the most exclusive Baby product in the world.Love it. All Baby product very nice and very helpful.